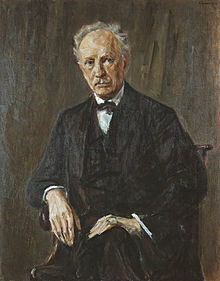 Richard Strauss (born Munich June 11 1864; died Garmisch-Partenkirchen, Bavaria, September 8 1949) was a German composer. He soon became very famous when he was a young man. His tone-poems were played by orchestras all over Europe. After 1900 he spent most of his time writing operas including Salome. His opera Der Rosenkavalier, written in 1910, is extremely popular. Strauss was the last great composer who wrote in a Romantic style. He liked the music of Wagner who was a great influence on his music, but he also liked Mozart and his works also shows the elegance and grace of Mozart’s music. Strauss was a very good conductor and often conducted his own music. He is not related to the Austrian Johann Strauss family famous for their waltzes. This page was last changed on 27 November 2013, at 06:46.